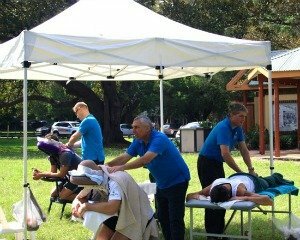 Organising your Corporate Wellbeing program or just Corporate Massage can seem like a challenge, but here at Absolutely Corporate we’re able to make the process as easy as possible, while ensuring you end up with the ideal program for your workplace. Here Beata Steiner, Director of Absolutely Corporate explains the process. “I am often asked what is the best way to book corporate massage for a large organisation. Firstly we need to know how many people there are in your company who will be taking part. Next, how long would you like for each massage, we offer 10, 15, or 20 minute sessions. We recommend no less than 10 minutes, and we usually provide 15 minutes massages per person. We also recommend you organize a small meeting room or a quiet office for each massage therapist to work from. This ensures each employee gets their time out without any interruptions. We feel this is really important to ensure employees reap the benefits of massage and become more productive employees. For short massages we can massage your staff at their workstations. If you have a multiple locations just let us know how many people in each location so we can organise an appropriate team. Companies with large numbers of staff, such as 100 or more, often don’t want their staff waiting for too long to have a massage. We allocate a team of massage therapists to cover your chosen time frame. Do you have some restricted days? Do you have staff who work from home, if so do you need to organise dates when all your employees are present. We’ll also need details of your address and where to go in your building to setup. For our regular bookings we always have the same therapists booked to you as a client. This ensures a strong client/therapist relationship which improves the quality of care and gives higher satisfaction for your staff. They feel they get more out of a massage when they know the therapist, who knows their health issues. What makes us unique is that we welcome our new clients when they book corporate massage and offer a complimentary De-Stress lunchtime seminar, courtesy of Absolutely Corporate and certified wellness and executive coach Gitana Gataveck. It is a great chance for your staff to step away from their desks and gain some wonderful knowledge about the underlying causes of stress along with some important tools to put in place in order to avoid the potential problems associated with stress. Your team will definitely leave the session feeling lighter and more prepared than when we walked in! We have an online booking system where your staff can log in and schedule a time slot for their massage. It’s easy to use and a huge time saver. Your staff will receive a confirmation email and a reminder one hour before their massage. The whole process is very easy and fuss free so that you can enjoy your massage without having to worry about anything.